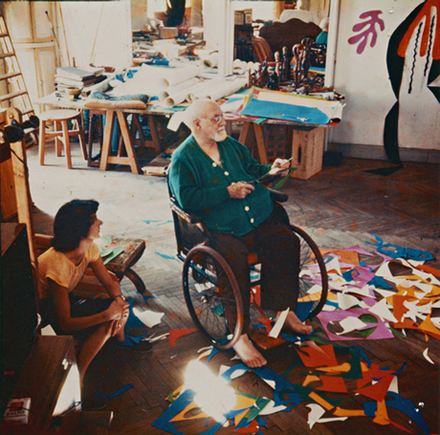 Matisse in his studio at the Hotel Régina, Nice, c1952. 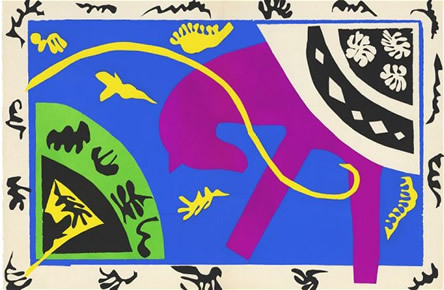 Late Philadelphia artist, friend and ‘68 Tate Fellow Sam Maitin readily cited Henri Matisse’s Cut-Outs as his primary artistic influence. Maitin was not alone in his citations. Other artistically inspired offshoots of the continually creative Matisse, among many, included painter Mark Rothko, who attributed his large blocks of colour to Matisse’s inspiration and artist Lee Krasner, who composed her paintings, then cut them into pieces and reassembled them a la Matisse’s acclaimed Cut Outs. Arranging this exhibition must have been a challenge as the artist preferred his works to be displayed as created, rather than according to subject matter – the path exhibitions tend to follow. At Tate Modern, viewers are able to enjoy the best of both worlds, with smaller paintings setting off juxtapositions of Cut-Outs in earlier rooms before horizons expand to the immenseness of multiple Cut-Outs, originally displayed en masse, delighting the senses together, as the exhibition progresses. 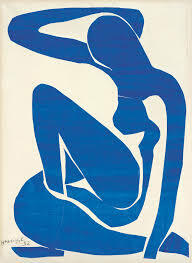 Iconic images from Jazz, a series of paper cut collages in colours of vivid contrast, originally meant to accompany a book of poems, became a Matisse composition in its entirety when the publishers decided to use the artist’s descriptions of his artistic process as its text, copies of which are on show here. Viewers enjoy a commanding selection of these seminal works, among them, ‘Icarus’ (1943) and ‘The Horse, The Rider & The Clown,’ (1943 – 44) just two of several on show from the series. As full of paradoxes as art itself, throughout the exhibition, more is ever, more, never more so, perhaps than in Room 5, ‘Vence, the Studio’, in which a wall full of colourful, individually framed and mounted Cut-Outs hang, affording glimpses into the collective power they once exuded in a room where they shared one very uncommon wall. So uplifting are they at first glance that one succumbs to the temptation to linger before them, focusing on each individual work in turn, delighting in its nuances. 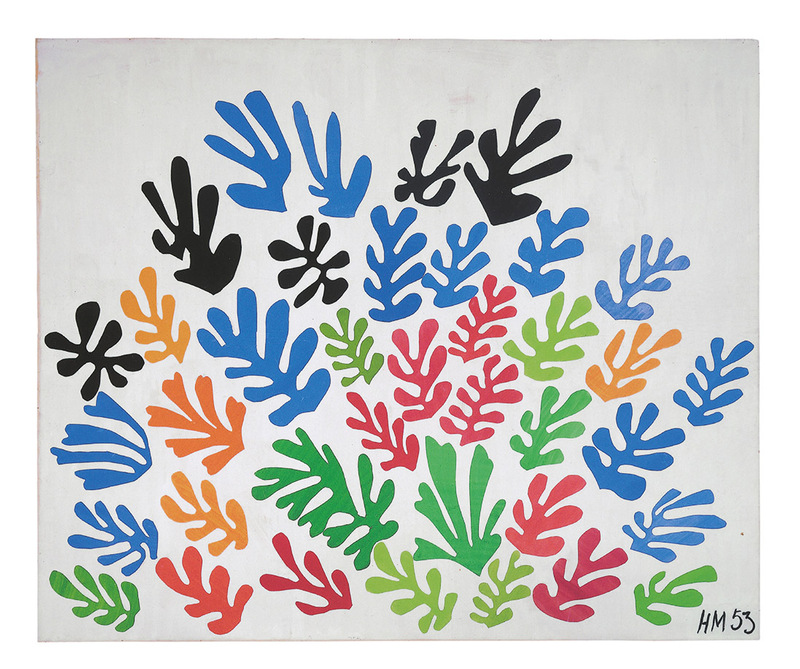 Equally alluring are Matisse’s larger works forming centrepieces elsewhere, such as in Room 10, where wall covering ‘The Parakeet and the Mermaid’ silently and serenely, holds court. Similarly compelling, in a very inspiring way are the contents of Room 13, ‘Acanthuses’ and ‘The Sheaf’, the latter a seeming explosion of colour, prompting that age old artistic question, ‘How did he do it?’ in Matisse’s case meaning, ‘How did he infuse such seemingly simplistic forms with so much life and presence?’, as the work consists of a number of variously coloured shapes relating to the form Matisse is most known for, a frond like one reminiscent of lush jungle growth. Along the way, others pleasures beckon, such as the notable presence of four ‘Blue Nudes’ (1952), shown together for the first time in the UK. Somewhat irregular blue shapes on gleaming white, suggesting women with their torsos turned showing buttocks and breasts; they have the power to suggest so much more than that which they technically consist of, their presence being their magic. Tate Director/Co-Curator Nicholas Serota has simply deemed this exhibition a ‘once in a lifetime’ experience, and as you move through its rooms, as though through a veritable arbour of creativity, taking in the sights Matisse’s once in a lifetime vision has afforded you, you too will share that view.